The Ball family saga continues with Lavar Ball and his sons LiAngelo and LaMelo landing in Vilnius, Lithuania, days before the brothers make their professional basketball debuts. 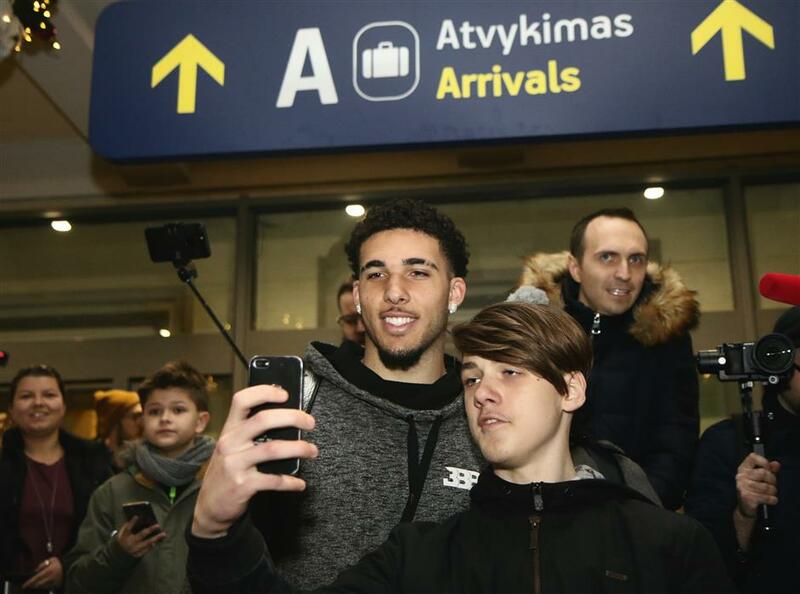 US basketball player LiAngelo Ball poses with fans on his arrival at Vilnius airport in Lithuania late on Wednesday. LiAngelo and his brother LaMelo Ball will make their basketball pro career debut with the Lithuanian Vytautas club. Flamboyant basketball dad LaVar Ball landed with two of his sons in Lithuania late on Wednesday to begin their international pro careers, calling it part of their “journey” to the NBA’s Los Angeles Lakers. A Twitter feud with US President Donald Trump shot LaVar Ball into the international spotlight in November.Trump accused him of being an “Ungrateful fool!” for downplaying his help in getting son LiAngelo returned to the United States from China. The 19-year-old had been arrested along with two UCLA teammates for shoplifting designer sunglasses. After UCLA benched the youngster, dad LaVar agreed to a contract offer in Lithuania. “I’m gonna get all my boys on the Lakers, but we gonna come over here and have some fun first,” Ball senior told reporters after landing at Vilnius airport. His eldest son Lonzo, 20, already plays in the NBA for the Lakers. Sons LiAngelo and 16-year-old LaMelo will make their pro career debut in Lithuania for the Vytautas club, ranked last in the Baltic EU state’s basketball league and located in the small southern town of Prienai, with a population of 10,000. The contract, signed last month, triggered interest on both sides of Atlantic. “You know what, we didn’t choose Lithuania, Lithuania chose us,!” LaVar Ball, who created the “Big Baller” brand, told reporters. Basketball is dubbed the second religion after Catholicism in Lithuania, a country of 2.8 million that is ranked number five in the world. The Vytautas club tied for last place in the 10-team national league.A special “Party Bus” took the Balls to their new residence at a luxury spa hotel in the resort town of Birstonas, just across the river from Prienai. The younger brothers of Lonzo, the LA Lakers’ star rookie point guard, will play more minutes in the less competitive Baltic League, with their debut likely next Tuesday. “Most of the journalists are hyped on their arrival, but not actual playing. We all understand that this deal is not about basketball at all,” sport analyst Donatas Urbonas said. “It’s all about Big Baller brand,” he added. The Lithuanian club has also described the contract as a “commercial project,” and has already attracted new sponsors after the deal was signed, according to local media. A scrolling red LED sign on a restaurant in the host town exclaimed “PRIENAI GOT BALLS!!!! !” ahead of the brothers’ arrival. They will shoot hoops in the nearby 1,500-seat gym.“We were told they eat only pizzas and burgers. We have both so we don’t need to change much,” says Jaunius Malisauskas, the owner of TangoPizza. Locals are hoping the Ball deal will put their town on the map. “Nobody knows where Prienai is. Maybe now they will,” 49-year-old construction worker Rimantas Bisliukas added. Lithuania’s Foreign Minister Linas Linkevicius also offered a warm welcome to the teens.“Looking forward to watch you playing in #Lithuania — the temple of #Basketball — Ball Brothers! Definitely winning destination!,” Linkevicius tweeted. US President Trump’s Twitter tirade made the family famous after the LiAngelo’s Chinese shoplifting escapade. “It wasn’t the White House, it wasn’t the State Department, it wasn’t father LaVar’s so-called people on the ground in China that got his son out of a long term prison sentence — IT WAS ME,” Trump tweeted.